One of my hobbies is walking. Both the Lake District and Peak District are not too far from me. I have not done as much as I would have liked to recently – my weight became a real problem on the climbs. However, entering 2006 with a new lighter me, I fully intend to get out more. I will detail some of these walks here as with the many photos I am bound to take. 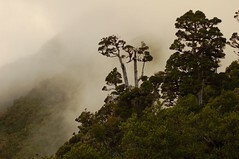 Taken from a viewpoint over the Franz Josef Glacier, this photo shows the bush and the clouds – interesting view. Part of quite a few new photos taken on my recent trips around the South Island – and finally uploaded to Flickr! 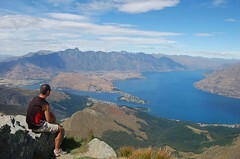 Taken from the top of Ben Lomond, overlooking Quenstown and the Remarkables Mountain range. I have written about this walk on another blog I contribute to – Ben Lomond on Spare Weekend. Today I received my order from Alpkit – a fairly new web only ourdoor kit retailer. The service is excellent – I ordered late on Monday night, and my Good were sent Tuesday and received this morning. The website is very good bot in terms of design and content. Ordering was prett easy, but my credit card had a problem processing via the site. However, they rang me back and sorted it over the phone the next morning. I have not heard of this affecting anyone else, so I am assuming its just me. The kit looks good so far – I got a Wee Airic (Â£15 light, short Therma Rest thingy), a Â£5 LED head torch and some pimp Alloy pegs. I intend to review the kit in due course, as soon as I get to test it. Striding Edge looking towards Helvellyn – walked this on Sunday in major heat . We went from Glenridding, up Miry Beck, then onto Striding Edge and Helvellyn. We returned via Swirral Edge, Catsycam and Red tarn. A good walk and a reasonable challenge – I could feel it in my legs for a few days after! 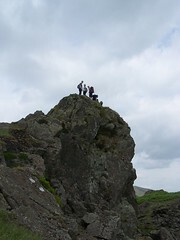 Very distinctive rock on Helm Crag, named the Lion and the Lamb. 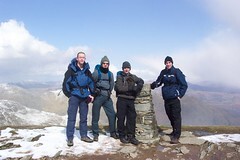 Stood on top are Matt, Freeman, Dave and Nige. Cameras on charge – finally going back to the Lakes for a walk tomorrow. Looks like this walk is the plan. Not been walking for 6 weeks or more – but have been doing a lot of biking so hopefully my fitness will be good. Since summer seems to be here, I know I can also pack pretty light – my montane windshirt should be enough, a full waterproof should not be needed, as the temperatures and wind speeds look pretty good. Panoramic shot made with 3 images using Autostich software, showing Brown Pike and Buck Pike. 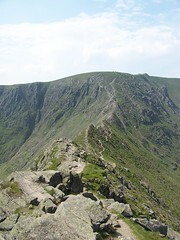 Dow Crag is on the same ridge. Taken from the Walna Scar Road. Scafell Pike and Scafell taken from the summit of the Old Man of Coniston. This view just opened up as the cloud broke and I got a few shots in – this was taken with a pretty large amount of zoom – equivalent to 268mm focal length, or about 7x (roughly). The shot was taken in April when there was plenty of snow on the tops . Taken from the top of Coniston Old Man (802m) on Sunday. After dire weather forecasts, the weather turned out well – it snowed for about half an hour and it was cold in the wind. In the sun it was fantastic. We walked the Walna Scar Road and then round Buck Pike, Brown Pike, Dow Crags and then the Old Man. Did Scafell Pike from Wasdale Head yesterday – a very cold and wet day. The weather started to pick up as we came down and we caught glimpses of the fantastic Wasdale valley. 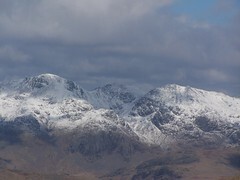 I will have to come back and do Scafell Pike again sometime to see the views. Walk was about 6 miles, with around 3500 feet of ascent. I have to plot our actual route on Memory map before I can be sure – navigation was tricky with poor visibility, and there is still snow high up.